Now that the "Killer Bees" are established here in San Diego County, finding a swarm or established nest of bees on your property may raise some questions, and maybe some concerns. The Escondido Fire Department offers the following information in order to help you know what to do, what not to do, and who to call, in order to reduce the chances of becoming involved in a stinging incident. Africanized Honey Bees look just like the European Honey Bees we've always seen visiting the flowers in our gardens. They function and behave similarly, too, but the Africanized Honey Bee is much more protective of its home. 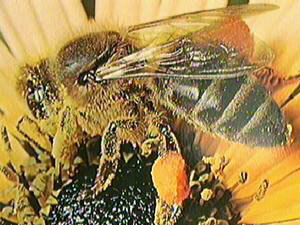 Just like the European Honey Bee, each Africanized Honey Bee can only sting once and then it dies. Also, the venom in either single sting isn't a problem unless the victim is allergic. The difference is that Africanized Honey Bees are more easily disturbed and respond more quickly, stinging in greater numbers, and taking more time to calm down. Like European Honey Bees, Africanized Honey Bees forage for water, pollen and nectar wherever they can find it and will visit our gardens to do so. They are not likely to attack unless they are disturbed. Left alone, they will pollinate your flowers and then return to their nests without any problems. Also like the European Honey Bees, Africanized Honey Bees swarm. This simply means that a colony has become overcrowded and it's time for many of the bees to leave. They take off together in a group, technically a "swarm," in order to establish a new home. While a large mass of bees, buzzing through the air may seem threatening, it's not interested in attacking anyone; its only purpose is to establish a new home. A swarm will often find a place to rest, in the branch of a tree or other comfortable spot, for a day or two, and then it will usually move on. If the swarm is left alone, it is not especially dangerous, but do not attempt to move or destroy it yourself and, if possible, stay out of the immediate area. You may need to close your windows and stay inside. If avoiding the area is impossible, you may wish to contact a professional to remove the bees, even before giving them a chance to move on by themselves. If bees come indoors, turn out the lights so that the bees will be attracted to the windows. If possible, open the window or door closest to them to let them out. If the swarm does not move on after 2-3 days, but stays and begins to build a nest, it is best to have it removed or exterminated by a licensed bee removal service or exterminator as soon as possible. The larger the nest, the more difficult it can become to remove and the more it will cost to do so. Also, as their nest grows larger, the bees become more defensive and more likely to attack if they feel threatened. If you have a nest that has existed on your property for quite a while, but are not concerned because they have not been a problem, plan to have it removed as soon as you can, anyway. An existing nest of European Honey Bees can be taken over by Africanized Honey Bees without your knowledge and can suddenly attack with minimal provocation. An existing nest can also attract more bees to the area. 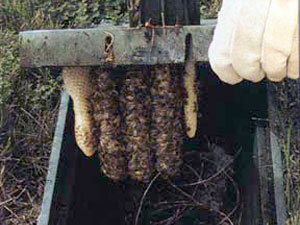 Again, do not attempt to remove any nest of bees yourself; have a professional bee removal company remove it. Make sure that the responding person is a state licensed pest control professional, bonded and insured and trained in honey bee removal. If requesting an estimate over the phone, be prepared to describe the size of the swarm or hive and whether it's in an exposed area or within the walls of a structure or other hard-to-reach area. If the bees have established a hive, make sure that the company removes all traces of comb and honey in order to reduce the chances that bees will return and to prevent attracting rodents, other insects, and developing bad odors. Clay pots – Stack clay pots upright, rather than inverting them and creating a welcome home complete with drainage hole door. Water meters – Be aware that these sites also feature doors and voids. Inside walls – Honey bees can enter a hole ¼ inch in diameter. Patch holes in stucco, install metal screen across vents, and seal the area where faucets and pipes come through the wall. Sheds and playhouses— If rarely used, inspect cautiously as you enter for the first time, especially if children plan to play there. Disturbing an established nest of bees can result in a serious stinging incident. If you attempt to remove a swarm or hive by yourself, you risk injury to yourself, your family, and, possibly, your neighbors. Ignoring a nest on your property can also be dangerous and pose a liability. Keeping bees is against the law within the City of Escondido. As always, the Escondido Fire Department responds to life-threatening emergencies and will respond immediately if a victim of a bee stinging incident requires rescue and medical care. 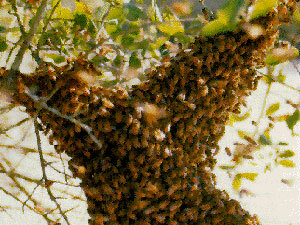 We do not, however, have the resources to remove swarms or hives; a licensed exterminator should be called if needed.